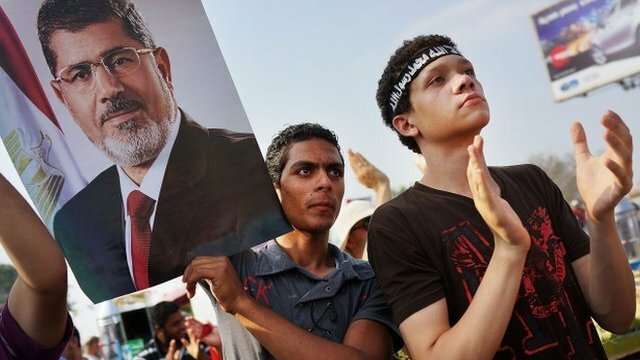 Crossroads becomes 'Islamic Republic' Jump to media player Supporters of Mohammed Morsi are camping out at a major crossroads in Cairo in protest at his overthrow by the army. 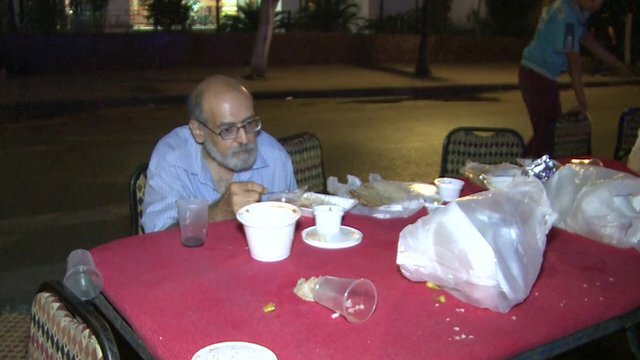 Will Ramadan affect Egypt crisis? Jump to media player In Egypt, the holy month of Ramadan has got off to an anxious start, as people wait to see how the month of fasting effects the country's ongoing political crisis. Need to Know: Egypt Unrest Jump to media player Arab affairs analyst Magdi Abdelhadi explains why renewed protests have flared up on the streets of Cairo, and what they could mean for Egypt's future. 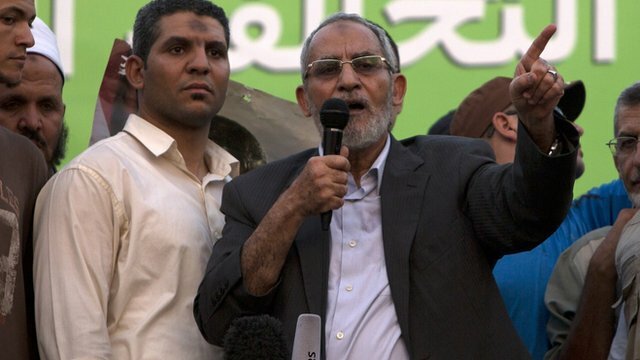 Egypt orders Muslim Brotherhood arrests Jump to media player Egyptian prosecutors order the arrest of Muslim Brotherhood leader Mohammed Badie on charges of inciting violence, state media say. 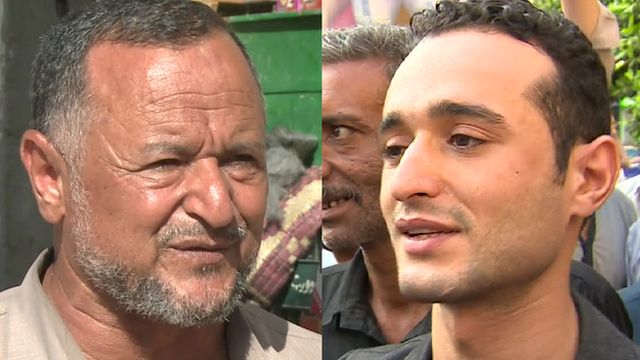 A father and son on opposite sides Jump to media player Aleem Maqbool has spoken to the Douma family in Cairo, a father and son who are on opposite sides as the unrest continues. Egypt opposition rejects poll plan Jump to media player The main liberal opposition coalition in Egypt has rejected interim leader Adly Mansour's decree, which sets a new poll timetable to stop the unrest. 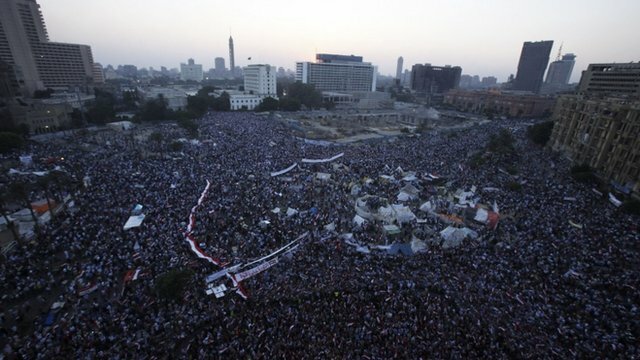 Supporters of Mohammed Morsi are camping out at a major crossroads in Cairo in protest at his overthrow by the army. Makeshift tents have been set up in the street and in some cases entire families are living in the area. Jim Muir in Cairo says the area has become a kind of "Islamic Republic" with those protesting insisting they will not move until the president is reinstated. Go to next video: Will Ramadan affect Egypt crisis?